Without question, the top reason the defense gave the entire organization indigestion in 2015 was a lack of taking the ball away. We all know how closely correlated turnovers are to winning and losing, and when you have arguably the most disappointing season in franchise history (expectations to reality) and you also have the worst takeaway year in the history of the sport, the two things can often be linked together. 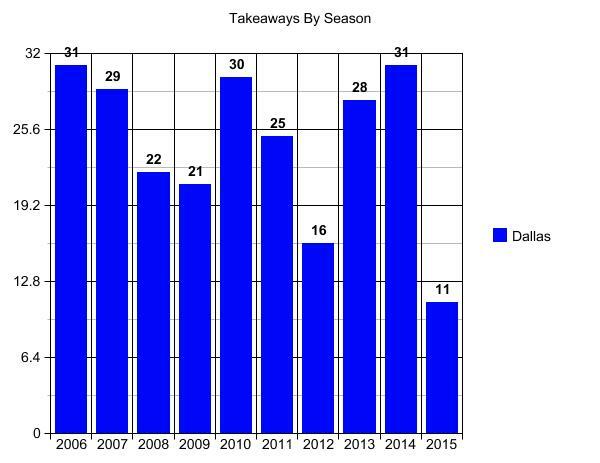 IN THE HISTORY OF PROFESSIONAL FOOTBALL RECORD KEEPING, NO TEAM HAS EVER HAD FEWER TAKEAWAYS THAN THE 2015 DALLAS COWBOYS. In fairness, the 2013 Houston Texans had just as few (11), but now the Cowboys can imagine how many teams and how many years of football has been played to consider just what that means. Pick any team and pick any year you can think of from the time you were a baby or perhaps even when your father was a baby, and that team in that given year took the ball away more than 11 times. While it may seem impossible to fathom, it is true. You can see that of all of the mysterious issues of 2015, this is a stat -- the lack of interceptions and fumble recoveries that cannot be blamed on Tony Romo's collarbone, right? Back after Week 8, we talked about one item that clearly seemed to explain how all of the issues are tied together -- and I wanted to update those numbers to complete 2015 this morning. In 2014, the NFL had 32,784 plays (which tells you that with 32 teams, each defense faces about 1,000 snaps a season). In that total, 19,094 passes occurred which resulted in 450 interceptions and 1,211 sacks if you total up the defensive accomplishments. But, here is where game theory comes in -- if you divide those 32,784 plays into two categories, you will see the stats begin to tell you a story. The categories are: 1) plays in which the defense is ahead by four points or more and 2) plays in which they are not. If you simply divide it into those two, you see how the game is different for a defense with a lead of more than a field goal. Stay with me. There is a lot here. But, look, the top row shows normal situations. The bottom row is what happens when you get to play defense against an offense that needs points. Look at the run/pass balance. When game is neutral, it is nearly a 50/50 run and pass split. When you fall behind, it turns to 67/33. Now, look at the number of passes for a team that is behind. Just 8,352 passes (43 percent) in a league that threw 19,094 times. But, that 43 percent accounted for 54 percent of all interceptions (241 of the 450) and almost 50 percent of all sacks. That is incredibly disproportionate and shows a few things. 1) Offenses clearly are forcing the ball into spaces more. They need points. They have to get more aggressive. 2) Newbury has this one: "To me, it's more about the D-line being able to go get the QB without worrying about stopping the run. The offense is forced to throw more and run less. They throw 67.4 percent of the time when losing by four points or more. Look how balanced the offenses are when they are winning ... And teams abandon play action and sprint-outs when they are losing. The QB stays in the pocket more, thus the D-line knows where he's going to be before the ball's snapped. Heck, think about what Romo went through when opposing defenses knew he had to throw the ball. Defenses weren't honoring the run. They were pinning their ears back to get to Romo." So, if the numbers prove that you need a lead to get most of the turnovers in the league, then it stands to reason that we have been looking at takeaways wrong all this time. Maybe it isn't that teams are good because they get takeaways. Maybe it's that they get takeaways because they are good. Do certain teams always get takeaways because their offense puts them ahead, and thus the opponent has to do things they are not comfortable doing? How does this apply to the story of the 2014 and 2015 Cowboys? In 2014, the Cowboys defense was on the field for 978 snaps. In 2015, it was 997 snaps. Roughly, that is just one more snap per game -- 61.1 per game in 2014 to 62.3 in 2015. Negligible. There is almost no relation whatsoever to this ridiculous theory that the 2014 team never let the other team on the field. As you can see, they did at nearly an identical rate with Tony Romo and DeMarco Murray as did last year's team. No matter how great your offense is, the other team gets the ball back every time you score. In a make-or-take it league, this would make more sense. Unfortunately, that only exists on basketball playgrounds. You certainly didn't need an eye-catching graphic to show you that the team was never ahead last season, but if we believe that most interceptions and sacks happen when a team is ahead and the other team has to force the issue with determined passes and the defense not worrying about your running game, then we can quickly see that the Cowboys defense was never in this position -- just 16 percent rather than 49 percent. We could run the numbers of how this played out -- but given that the Cowboys were never ahead all season long, there is almost no data. The best example was Sam Bradford throwing into the Cowboys secondary in Week 2 and throwing picks. But, those are the only three turnovers the Cowboys got from advantageous spots all season. Five of the 31 sacks came from those small spots, too. The pass rush actually improved significantly. They had 31 sacks in 506 pass plays this past year -- one sack every 16.3 pass plays. In 2014, it was 28 in 558 -- one sack every 19.9 pass plays. That is a very significant improvement to where they are almost at league average. In 2014, they were not close to the league average, despite being in a spot to get a ton of sacks. But, in 2015, despite being a better pass rush team -- they never were able to force teams to throw. So, we circle back to the start. How does the offense help the defense? By getting a lead and forcing other teams to respond. They will still get 60-65 snaps, but if more of them are passes, the turnovers return and the sacks add up if everything else is equal. And that is specifically how this should work. This is part of my series to film study each of the Cowboys draft picks who were not covered prior to the draft. Today is the 4th-round pick, DE Charles Tapper. We will follow the template from the 50 profiles done pre-draft in the early spring. I have never been a scout or a NFL general manager, but I am willing to watch a ton of football. By watching about 200 snaps of each prospect, we can really get a feel for a player and then know what we are talking about a bit better. It is no exact science, but the NFL hasn't quite figured out drafting either, so we are going to do the best we can. To read more about the 2016 NFL Draft Project, click here. The 4th round of the NFL draft has produced some interesting picks for the Cowboys over the years and there have been some important pieces secured. Without question, the finest have been offensive linemen like Tom Rafferty (No. 119 in 1976), Pat Donovan (No. 90 in 1975), John Fitzgerald (No. 101 in 1970) and Doug Free (No. 122 in 2007). Additionally, Tony Tolbert (No. 85 in 1989), Bradie James (No. 103 in 2003) and Chris Canty (No. 132 in 2005) all have served as key defensive pieces. The team also has recently found some running backs of various levels of quality -- Marion Barber (No. 109 in 2005) and reserve roster player Tashard Choice (No. 122 in 2008). However, since Doug Free was picked in 2007, this has been a rather barren wasteland in terms of finding starters or key pieces. In fact, several of these Round 4 pieces have had trouble ever stepping on the field for Dallas -- LB Brandon Williams in 2009, DB Akwasi Owusu-Ansah, DB Matt Johnson, QB Stephen McGee and OL David Arkin all produced only punchlines in these parts. 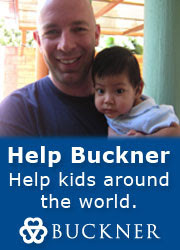 Others like Victor Butler or B.W. Webb are sold as potential developmental pieces, but never materialize. Anthony Hitchens seems a very solid pro and hopes are still high for Damien Wilson, but the team could really use some 4th-round dividends from their two picks this year -- Tapper and QB Dak Prescott. With three picks in the 3rd and 4th rounds at the draft, the Cowboys seemed to have the plan of taking two DL pieces and a QB. In the 3rd round, they selected the 3-technique in Maliek Collins. In the 4thround, they had high hopes of grabbing Connor Cook at No. 101 until the Raiders snuck up to No. 100 and sabotaged that idea. The Cowboys then decided that Prescott was not worth that pick, so they went DL there and tried to get their QB down at No. 135. It worked. Tapper clearly is one they have plans for right away as they wanted to fortify the defensive line with numbers and talent. What I liked: Tapper is best known for his position-best 40-yard dash time at the combine (4.59 with a 1.59 10-yard split), for which he was down to 271 after playing around 280 in the fall. He is a defensive end who can move a little in tight quarters and obviously has some impressive straight-line speed. He has a little chase in his game and there are definitely times when you will see a red-hot motor. He played the defensive end for Oklahoma, which is basically a 5-technique, 2-gap technique in run spots and more of a typical 4-3 DE on passing downs. This allowed him to make quite a few plays in his time at Oklahoma, where he had 15.5 sacks and 26.5 tackles for loss over three seasons as a starter -- despite playing in a system many would suggest was asking him to sacrifice for the scheme. He has a bull-rush that can put tackles on roller skates and he has a surprising spin move that opens up many opportunities to get to the QB. He also is able to get the football, having stripped the ball four different times last season alone. He stands up well against the run, where he will not get pushed around, and also has a bit of a pass rush in him. He certainly appears to be a decent idea as a strong-side defensive end and has a chance to be 290 by his second season. He plays with some infectious emotion at times. What I did not like: There are long stretches when Tapper is not a real factor as he gets neutralized at the snap and doesn't have a full array of moves. The idea is that his skill set is not fully developed between very limited playing time in high school and 2-gapping in Norman. The Cowboys are pretty sure they can teach him the tactics he will need, but for now, I might classify his arsenal as "raw." His quickness is not going to blow you away (I was certainly expecting a little more twitchiness from a sub-4.6 DE) and he will get hung up in traffic on his way to the play. I think this stiffness will keep him from being a real pass-rush threat, but that certainly is not what the Cowboys were targeting here. They wanted a strong player with versatility and I think that much is evident. It should also be pointed out -- as you can tell in the video -- that he put up a lot of his production against Kansas and Iowa State. They all count, but as we try to convert that to Sundays, we must be somewhat skeptical how that translates. Summary and potential fit with the Cowboys: It is very important to understand where the bar is at in the 4th round. If you can get a rotational fit with pick No. 101, you have to be pleased. This is not a point in the draft where you find flawless players who should step right in and start. Instead, you find pieces that seem like solid rotational players who might be able to find higher spots on your depth chart if they can be developed. I think the Cowboys have quietly assembled a defensive line that has very little sparkle with name recognition, but has plenty of young talent that might grow together and become something decent. DeMarcus Lawrence is 24, Tyrone Crawford 26, Randy Gregory 23, Benson Mayowa 24, Jack Crawford 27, Ryan Russell 24, Cedric Thornton 27, David Irving 22, and now they add Maliek Collins at 21, and Tapper, 23. Those are 10 players on the defensive line who are an average of 24 years old. Now, is there enough quality there to scare anyone? The only one they are paying big money to is Tyrone Crawford. Everyone else will get a big chance to prove they deserve a check. Tapper is right in that mix. He has tools but needs to polish the rough edges and show he can contribute on Sundays. But, for me, he is exactly the type of piece you try to get in the 4thround. He has a chance to be of great value. Another week is somehow in the books -- time flies when you are having fun -- and we are down to 16 weeks until the regular season starts! What better way to spend a little of your Friday than with some Cowboys mailbagging! Q: Where would a completely healthy Tony Romo rank among your top NFL QBs currently? I think this is a pretty solid place to start and I guess it all depends on your level of optimism. So much of any Cowboys prediction rides heavily on what you believe about Tony Romo. He says all the right things and we all hope that he is telling the truth and everything turns out fine. We just talked about this on the radio yesterday because I am working on a project that asked me to look at all of the interceptions the Cowboys threw in 2015. My memory has already started to fade out the details of this very forgettable year a bit, but actually looking at each game brought a lot of things back to my attention. In my head, it was clear that the horrid play of all of the backup QBs was the biggest culprit (after we blame the collarbone sufficiently). But, as I looked at the 16 games, it was pretty shocking how poorly Romo played QB in those four games he did play. The throws were not good overall. He gave us a few moments of fun against the Giants and at Miami, but overall, Romo looked like he was playing hurt when he was out there. Even some of his good throws against the Dolphins, for instance, looked like looping throws, rather than the Romo fastball. This puts you in a spot where that voice in your head is hoping that this was mostly a case of him rushing back when he wasn't quite right. He was bailing out of passes in November because deep down inside, he knew that his shoulder could go the first time he took a real hit (he was correct, by the way). So, I say all that to say this: Watching his snaps in 2015 were a bit disconcerting overall. Statistically -- with a small sample -- he had his lowest QB rating and highest interception percentage of his career. This after the 2014 Romo had the highest stats of his career. He also turned 36, where we start to wonder when Father Time will start taking some of these extraordinary athletic gifts away from our athletes. So, does 2014 Romo still live here? Everyone is hoping. So, where does a healthy Romo rank in the NFL? Well, the 2014 Romo had a gripe about the MVP award. That puts him in the top five easily and maybe higher. If that guy is still in that body -- and his body can take the hits that every QB (even with a great offense and a great line) must take -- then we can say that when he is right, he is still among the best. And clearly, every Cowboys decision seems to drip with the premise of "Tony Romo is still a great QB." I guess we ignore our eyes and hope they are right. Not sure what other choice a Cowboys fan has right now. Q: What's a realistic expectation for the Cowboys, record wise, in their first four games with their top two pass-rushers suspended? The first four games of the Cowboys schedule are: Sept. 11 vs. Giants, Sept. 18 at Redskins, Sept. 25 vs. Bears, Oct. 2 at 49ers. There are no world beaters in this group and there are no projected playoff teams (at least in my head). So, with a defensive line of Tyrone Crawford, Cedric Thornton, Benson Mayowa and Jack Crawford starting with David Irving, Ryan Russell, Maliek Collins, Charles Tapper and Terrell McClain behind them, I think they should be in decent enough shape against those opponents. I would say you hope for 3-1 and you settle for 2-2. So much has been invested in this offense, so you would sure hope that everyone is healthy and ready to go crazy in the first four games. In the next four games you do have a couple playoff teams and that means a pass rush should be more vital. I think the Cowboys' goal is to get to 9-10 wins and to do that, they will need to get through September in a strong fashion without the two suspended players. Q: So which is the best team in Texas in 2016: the Cowboys or Texans? Great question. Because I really think the Texans have a chance to be pretty solid this season. Everyone will talk QB, but how about getting Lamar Miller from Miami? I think that would have been the move I would have earmarked for the Cowboys back in March. (I did!) The Texans also play in a division that doesn't scare anyone, so I will likely have both teams win totals in the same relative area. I would also love to put a super team together that allows the Cowboys' offense to join the Texans' defense to win the Super Bowl for Texas. And, while in fantasy land, I would also like to make it mandatory that the Cowboys and Texans play every year. But, I am king of nothing and don't get to declare things from the throne with any effectiveness. So, I will hope it is the Cowboys, but I will say that without much conviction until this defense shows me some things. Q: Do you think Rico Gathers has a chance to make the roster out of camp or is he looking at a practice squad year? I am relatively sure that the only way Gathers makes the 53 is if they are sure he will be snapped up by someone if they try to sneak him through to the practice squad. To do so, they must expose him to the league and if he does anything special in preseason, that could be an issue. But, if you keep him on the 53, then there is a chance you are playing with 52 this year -- unless he can figure out special teams in one summer (which seems unlikely -- or impossible -- if you haven't played football since 8th grade). The most likely scenario? If he is really good in camp, I would watch for the season-long IR for some imaginary or small injury to basically keep him team property for the season without having to do any of the above. Teams do this all the time, and if that happens in late August, remember who predicted this for the biggest project the Cowboys have signed up for in years. Q: How much of a pass-rushing threat do you think Tyrone Crawford can be playing defensive end? I assume that he will be decent. And it isn't like Randy Gregory is DeMarcus Ware. I think those suspensions hurt more in body count than in actual quality in the short term. Sure, DeMarcus Lawrence is this team's best pass rusher, but that doesn't mean he is great. That means he is good and could develop into very good. Gregory hasn't shown much of anything at the NFL level that we should cry about his absence. He has a long way to go. I think with two free-agent additions and two draft additions, this team should be able to survive September in decent shape. Q: Which training camp battles would you be most excited to see come late July? Well, to be honest, this roster doesn't seem to have a whole lot of competition to start. I will write the 22 starters out on May 20th and I bet (injuries pending) that I can go 20 for 22 for opening night: Romo, Smith, Collins, Frederick, Martin, Free, Witten, Bryant, Williams, Elliott, Beasley on offense (11 personnel). Then, on defense: Crawford, Crawford, Thornton, Collins (this one is the questionable one), Lee, McClain, Hitchens, Carr, Scandrick, Jones, Church. The closest thing to battles will be free safety -- Byron Jones or JJ Wilcox -- and right tackle -- Free vs. Chaz Green. I don't really see either of those likely. Jones is the future at free safety no matter what and while Green may have some upside, I don't think they want him starting right away. Beyond that, this is your team, I believe. So then the competitions become for depth, like who is the fourth and fifth WR, who is the fourth and fifth LB, who are your third-down rushers, and so on. But, this is a veteran team that has been built to win now. They have most of their starters squared away. Now, the question is about depth and quality. Q: Saw ESPN projections story that had Cowboys winning East by four games over rest of teams. Sounds a little crazy to me, even in the best-case scenario. Your thoughts? My thoughts are that almost nobody ever wins a division by four games. And the Cowboys have to deal with the defending division champs in Washington, a talented team in New York, and I doubt Philadelphia is a concern. I think 9-10 wins will win this division and I think the Cowboys can be that team, but I would never project a runaway laugher. I also think I am having a hard time predicting anything in May with that degree of specificity, so I will defer to projections for those who want them. As for me, I will wait on everything else for next week. Have a fine weekend. Salary history and contract status: Williams is in the final year of his 4-year, $2.9 million dollar rookie contract that guaranteed $619,000. In 2016, he counts $1.6M base salary in 2016 and a $1.8M cap hit. He will become an unrestricted free agent after the 2016 season. 2013 draft profile from Ourlads.com: 6'2/208/4.51 ... Three-year starter who is a fifth year senior. Has played in 51 games in his career. Played in a spread zone based offense that distributes the ball to a variety of receivers and backs. Concentration and courage to catch over the middle. Soft hands. Holds the ball on contact. Good sized receiver who will compete for the ball in the air. Two of his biggest catches in 2011 were vertical '9' routes catching the ball for touchdowns versus Texas and Oklahoma. He can beat press man coverage off the line with his quick feet. Good contact balance to keep his feet after hit and get yards after catch. Uses a stiff arm to ward off low tacklers. Good cutting ability in space. He has also made the layout diving catches. An NFL caliber productive athlete who built on his strong junior year averaging over 18 yards per catch. A three level receiver who can go vertical and make the tough over the shoulder catch. Can separate with strength and a quick burst. An outside pass catcher who is athletic after catch. Ability to break tackles and split defenders. Eventual starter with developmental time. Caught 202 passes in his career. 2012 stats: 97-1832, 18.9 ypr, 12 TD. Second/Third Round. Pre-2015: Williams began his career in Dallas as the "bonus pick" the Cowboys received for trading back in the draft with San Francisco. They received the 31st and 74th picks to trade their 18th selection in 2013 with the 49ers and walked away with Travis Frederick and Williams. Most draft historians give that a pretty excellent value grade, but also note that Keenan Allen was taken 2 picks later (#76) by the Chargers. Williams jumped right into the action in 2013 when Miles Austin was playing his last season across from Dez Bryant. His first massive impact was the shootout against the Broncos in early October when he caught all 4 passes thrown to him for 151 yards and a touchdown. He has definitely helped cement the "Baylor WR" stereotypes of having a very limited route tree, but electric results when the team connects on one of those bread and butter routes. In 2014, with a healthy Dez Bryant on the field demanding safety support, Williams ran more "go" routes than anyone in the football. In fact, over 40% of his pass plays are some variation of the simple 9 route. Most of the rest have been slants and digs, and on several occasions -- including the 2014 Wildcard game against Detroit -- Williams has shown that if you allow a slant, he can take it 70-80 yards in a blink of an eye. As a 2nd WR, he would at least be considered league average. He has limited productivity, but with Bryant and Jason Witten on the field and the team running the ball over half the time, it all seems by design. He plays the "Alvin Harper" role well. 2015: Last season, the conversation changed. The events on the field required Williams to try to fill the role left by Bryant when Dez missed a number of games in September and October. In fairness to Williams, the QB play was substandard for most of the year and there were several verifiable moments where he was open and Brandon Weeden and Matt Cassel either missed seeing him completely or missed the throw. During the Weeden stretch of starts (Games 3-5) where the backup QB seemed determined to never throw the ball down the field and risk a turnover, the team attempted 18 passes to Williams of assorted lengths and Weeden connected on 5 for 79 yards. That 4.4 yards per attempt is enough to make an offense cry and shows why revisionist history cannot save the Weeden run in Dallas. It was about RB completions on repeated check downs and punt. The production returned with Cassel (although so did a number of interceptions in New York) and then upon Dez Bryant's return, some of the production returned, too. Williams did not drop many passes, but the team could not get him the ball often enough. He definitely had some highlight moments to show his improvement on physical plays that required aerial wins. But in total, he was disappointing as a #1 WR. In fairness, he really never got to play much in that role with competent QB play to show whether it was him, defenses keying on his strengths with extra coverage since Dez was gone, the QB, or the ultra conservative game plans that the team tried to win with. He ended the year with a career-high day against the Redskins as he caught 8 passes in 9 attempts for 173 yards -- which certainly helped his season stat line improve cosmetically. But, to be fair, if anyone deserved a final week of numbers to prop up a disappointing season, given what Williams had to work with in 2015, perhaps it was him. 2016 analysis: It is vital that Williams has a big year, if for no other reason to ensure he has a 2nd contract offer from the Cowboys. He has a lot in his favor, including some very high-end moments where he demonstrates his value, the fact he does look like an effective book-end (albeit with limitations) for an offense centered around running the ball and Dez Bryant, and he has played in 48 of the 48 games in his career. That said, almost without fail, there seems to be some uncertainty about whether the Cowboys should lock up the soon-to-be-27-year-old or to draft his replacement. Given that the best WR behind Williams for that spot is either Devin Street or Brice Butler, the team certainly doesn't have anybody that looks like an 80- snap guy ready to replace him. Looking at comparable players from the 2011 and 2012 draft classes, the results are all over the board for 2nd contract offers. Mohamed Sanu, who was significantly less productive than Williams, pocketed a 5yr/$32.5M deal ($14M Guaranteed) from Atlanta this spring. The same is true for Travis Benjamin, who signed a 4yr/$24M ($13M Guaranteed) with San Diego. Less production, great money. On the other hand, the Giants received very similar numbers from Rueben Randle -- despite a lesser role for most of his time there -- and then did not offer him anything at the end of his contract and the player who just turned 25 signed in Philadelphia for next to nothing 1yr/$1.5M (no guarantee). There is more to a player than just stats, but as you can see, those offers are all over the board. He is a complicated study. He is always on the field, yet is a guy who averages about 45 yards a game in his career and has never been close to 1,000 yards. At the same time, he has made some huge catches at huge moments and gets in the end zone which is a rather important attribute. Bottom line, the Cowboys get Williams for 2016 at a very cheap price. But, that will change in 2017. Either they decide to pay him between $6-$7M per season to keep him or they draft his replacement in 2017's draft and start all over again. Since I don't anticipate any sort of summer/training camp extension, I assume Williams' job in 2016 will determine their decision. This is part of my series to study film of each of the Cowboys' 2016 draft picks who were not covered before the draft. Today is the third-round pick, Maliek Collins. We will follow the template from the 50 profiles done before the draft in the early spring. The Cowboys entered the draft determined to get better on the defensive line and while they did not spend any of their currency in the 1st or 2nd rounds, they decided in the end to keep the 3rd and 4th round picks for this purpose. The historical record will show that in potential trades up for Paxton Lynch they flirted with trading a 3rd and then a 4thwhich might have cost them the QB of the future, but in the debates to not "overpay," they would discuss how the defense will suffer if they were to go RB and QB and then not pick again until Day 3. Collins was always a target for the Cowboys at pick #67, according to my sources. They always viewed him as a player that should get to them and as one they really coveted at that spot in the draft. That is important for us to remember when so much of the rest of the draft seemed to be snagged right in front of their pick (Ogbah in the 2nd, Connor Cook in the 4th). This guy was on their radar and targeted by their defensive personnel as someone they wanted to secure. Maliek is a team captain and a guy who was a real big part of the Nebraska defense over the last two seasons. In 2014, with Randy Gregory on the front attracting plenty of attention, Collins had a much more productive campaign, with 2015 offering plenty more occasions of double-teams and watching the inside tackles. I spent the last few mornings watching a few hundred snaps from each of the two years to see what has the Cowboys so excited. It is reasonable to assume they were locked in on him from their original Gregory work 18 months ago. What I liked: Collins is built quite thick, but possesses an explosive quickness that is both rare and appealing. When you study the draft game, it is easy to paint certainly body sizes with a similar brush, because it is extremely rare to find a defensive tackle that might be able to move like a linebacker in certain respects. But, Collins checks all of the boxes when you are looking for "Force Players" -- a metric that is calculated based on several combine measureables that seek players with quick explosiveness -- and he penetrates with purpose. He is clearly seen as a top 3-technique in this draft from a tools standpoint. He also possesses great strength in his lower body and when you combine that quickness with thighs that can squat nearly 800 pounds, you have the guy you want in the trenches. He has light feet, a fine motor, and keeps playing when the play is away from him. One thing he does that you never see from a man his size is he will occasionally stand up and rush as if he is a linebacker. It is beyond odd for a player over 310, yet he looks natural. The top video below is #7 Collins lined up as a middle LB on the rush. What I did not like: For all his great athleticism, it would be disingenuous to not investigate why he wasn't a top 50 selection. It appears to be for 2 basic reasons. One, he looks a little stiff at times and while that is hard to say for a player who just turned 21, we often see that being the difference between exceptional players and ordinary. Ordinary players can be neutralized simply because of not being able to work out of stalemates with some ability to wiggle through small cracks in the line. He shows he can do it at times, but gets hung up a bit too much for my tastes. But, I imagine the biggest thing that holds him back at this point of his career is simple production. A player with his skill set should have been more productive in 13 games for Nebraska, than 2.5 sacks and 7 tackles for loss. He is too quick and spends too much time in the defensive backfield for this curious lack of statistics to verify his dominance. What is interesting when watching him is that the player is constantly in the backfield with a chance to make a play. So, the obvious question is: "Will that be the type of player he is -- constantly close to making plays, but not actually making them?" Or, do the Cowboys assume that they know how to develop him to close those deals? It is clear that most players aren't on the scene repeatedly like Collins. So, he is separated from that group, but he also should not be put in the group of guys who have 8 sacks and 16 TFLs, because he hasn't earned that right. He is in the 3rd and middle group of promising moments, but still a bit of a work in progress. Summary and potential fit with the Cowboys: I think I just said it in the paragraph above -- he flashes. He definitely has those traits that you want, and he is a high character player who also possesses that thirst for making plays when the initial moment passes. High motor and high character with a full toolbox explains why the Cowboys moved Collins to the top of their list when Jaylon Smith went off the board and never had to deviate much from that name. They got their guy. Now, Rod Marinelli, who is incredibly particular about who he wants and what he wants to do with him, sees Collins as a pure 3-technique play who has the traits to be that coveted 3-down inside player who can rush the passer, destroy run plays with penetration, and spend plenty of time in the offensive backfield rerouting running plays and moving QBs off their throwing spots. He also will get plenty of chances to play early as the talks continue about Tyrone Crawford sliding outside in September as the team deals with their DE suspension issues. But, when things all snap back into place, they now feel like they have injury cover for Tyrone, a guy who can play with Crawford on passing downs inside, another solid rotation guy, and perhaps a starting 3-technique. The Cowboys are betting on his future and are thinking if they get this right he can be a Top 50 value down at #67. I see what they like, but now wait to see if they can develop him as well as they believe they can. Bottom line -- they have a 310 pound force in the defensive front who should be fun to watch grow into a real pro.